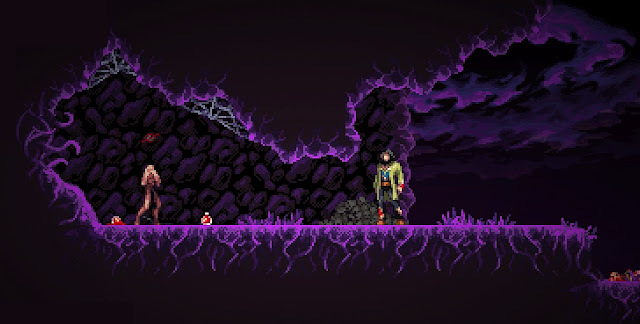 Indie Retro News: The Crown Stones Mirrah - Metroidvania-styled retro game gets a demo! The Crown Stones Mirrah - Metroidvania-styled retro game gets a demo! I know some of you don't like the term 'Metroidvania', a cross between Metroid and Castlevania, but how about if the game is of a similar type but is also inspired by Demon’s Crest and even Blackthorne, would you be interested? Well if you are, this is ' The Crown Stones Mirrah '; a very gory looking action platformer that doesn't just have lovely pixelated graphics but is inspired by an RPG book called “Spiritum o Reino dos Mortos”, with the game set in the same universe of that book. According to the creators, The Crown Stones Mirrah was a Steam Greenlight success and is currently going through an IndieGoGo campaign with a demo available for you to try. In terms of the game itself which features horror and adventure elements that becomes ever darker as you play, it also features fast and fluid gameplay with a back and forth dodge system as well as the mechanics of climbing platforms, together with a stealth mode and fighting system against enemies called “Rage”, which allows you to pull off stronger attacks. And that's just a taster of what's to come if the game reaches its funding campaign and is a success, but for the here and now, check out the current demo while it's in early access.